To Cite: Tekin Z N, Tekin A Ç, Çakar M, Çabuk H, Yirik G, et al. Accuracy of Magnetic Resonance Imaging in Identifying the Configuration of Meniscus Tears, Iran J Radiol. 2017 ; 14(4):e65299. doi: 10.5812/iranjradiol.29635. Background: Knowing the configuration of a meniscus tear is important for planning the treatment protocol. Objectives: The aim of this study was to evaluate the accuracy of magnetic resonance imaging (MRI) in determining meniscus tear configurations through a retrospective assessment of MR images from patients who underwent arthroscopy for an initial diagnosis of meniscus tear. Patients and Methods: A retrospective comparison was made between MRI findings and arthroscopic results of patients to whom arthroscopy was applied by a single experienced surgeon for an initial diagnosis of meniscus tear. The MR images were taken with a 1.5 Tesla unit. The meniscus tears were classified in subgroups as horizontal, longitudinal, radial, flap, bucket handle, and complex. Results: In 60 knees of 57 patients, 32 lateral meniscus and 48 medial meniscus lesions were identified by MRI. Of these tears, 33 were complex, 15 longitudinal, 13 radial, 11 bucket handle, 5 flap, and 3 horizontal. For the total 80 meniscus tears, MRI gave the same diagnosis as arthroscopy in 60 (75%). Longitudinal and flap tears had low sensitivity (79% in medial and 50% in lateral meniscus for longitudinal tears; 33% to 57%, respectively, for flap tears) but high specificity. Conclusion: MRI is an important tool in the imaging of meniscus tears, but for longitudinal and flap tear configurations that require arthroscopy, MRI diagnostics are especially insensitive. Nonetheless, MRI evaluation paired with good clinical evaluation can be considered useful when planning a surgical protocol and when defining the postoperative prognosis. Increasingly, problems are being found in the meniscus, a structure that has a significant role in knee functions. Magnetic resonance imaging (MRI) has become the imaging modality of choice for knee joint injury. MRI is also considered a reliable alternative to ‘‘diagnostic arthroscopy’’ because of its cost-effectiveness and low level of invasiveness (1). The types of treatment that can be applied to the patient in different situations can vary depending on the shape of the meniscus tear. Whereas the patient is monitored with a conservative approach in some situations, other situations call for meniscectomy or meniscus repair. Therefore, the application of MRI as a noninvasive, reliable, and easily applicable method is important for defining the type of tear, the location of the tear, and most importantly, the treatment approach (2). Although longitudinal and oblique tears can generally be repaired, partial meniscectomy is more commonly applied in horizontal, radial, and complex tears (2, 3). 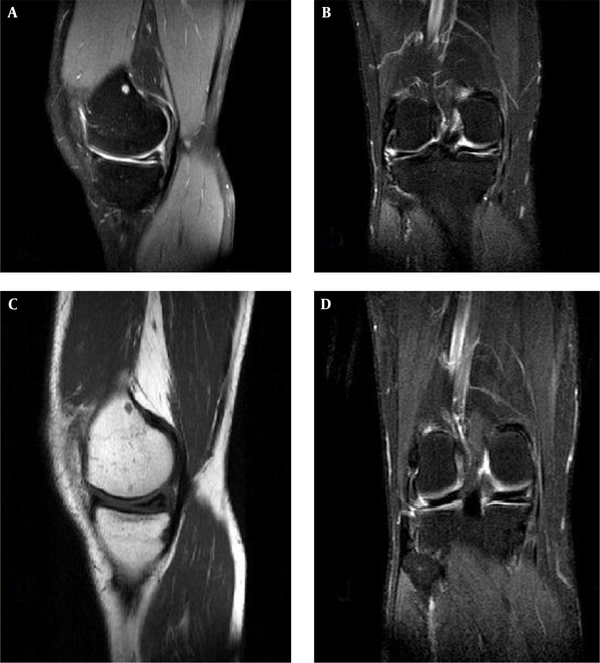 This study aimed to determine the accuracy of MRI in identifying meniscus tear configurations by retrospective examining MR images from patients who underwent arthroscopy due to an initial MRI diagnosis of meniscus tear. A retrospective comparison was made between the MRI findings and arthroscopic results from patients who underwent arthroscopy during a two-year period by a single surgeon following an initial diagnosis of meniscus tear in the orthopedic and traumatology clinic. All arthroscopic examinations were made by an experienced surgeon who had performed over 200 arthroscopies per year. Patients were selected from those aged 17 - 65 years, regardless of gender. Patients with any previous surgical intervention on the knee or who underwent arthroscopy more than two months after MRI were not included in the study. A total of 60 knees from 57 patients met these criteria and were included in the study. In the Radiology Clinic, MRI was done with a 1.5 Tesla device (Siemens Magnetom Avanto USA) using T1 weighted spin-echo (T1W SE) (repetition time [TR]: 580, echo time [TE]: 18) coronal; T2W turbo-SE fat-suppressed (TSE) (TR: 3800, TE: 71) coronal, axial, and sagittal; proton density (PD) (TR: 2040, TE: 12) sagittal; and T2W gradient-echo (GE) (TR: 16.65, TE: 6.9, flip angle: 30) directed to the cartilage in the sagittal planes, with a slice thickness of 3.5 mm or 2 mm with an extremity coil. All images were evaluated by the same general radiologist. Prior to this study, we held a training session in which radiologists and orthopedists reached agreement on the terminology used for meniscus tear morphology. The meniscus tears were separated into six groups according to the following definitions. A horizontal meniscus tear separates the meniscus into two parts that run parallel to the tibial plateau. A longitudinal tear divides the meniscus parallel to the meniscal axis and progresses to the tibial plateau at a vertical angle (Figure 1). A radial tear is perpendicular to the vertical and meniscal axis (Figure 2). A bucket handle tear is vertical and oblique to the meniscal axis but does not reach the meniscal axis. (Figure 3). A flap tear (parrot beak) progresses vertically and obliquely on the meniscal axis and reaches the center of the meniscus (Figure 4). A complex tear has two or more configurations (Figure 5) (4). By comparing the standard reference arthroscopy with MRI, we calculated the consistency of sensitivity, specificity, positive predictive value (PPV), and negative predictive value (NPV) of the meniscus tears. Figure 2. 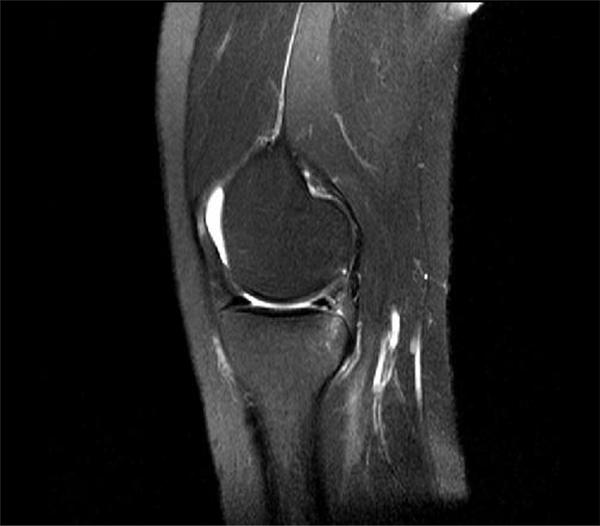 MRI of a radial tear in lateral meniscus. A, T2 fat-suppressed coronal image; B, T2 fat-suppressed sagittal image. Figure 3. MRI of a bucket handle tear in medial meniscus. A, T2 fat-suppressed axial image; B, T2 fat-suppressed coronal image, C, T2 fat-suppressed sagittal image with double posterior cruciate ligament sign shown as asterisks. Figure 4. MRI of a flap tear in medial meniscus. A, T2 fat-suppressed sagittal image; B, T2 fat-suppressed coronal image. Figure 5. MRI of a complex tear composed of flap, radial and longitudinal tear configurations in medial meniscus. A, T2 fat-suppressed coronal image; B, T2 fat-suppressed sagittal image. A total of 60 knees of 57 patients were included in the study. The patients included 22 females (38.6%) and 35 males (61.4%), with a mean age of 41.45 ± 14.11 years. Arthroscopically, among the meniscus tears in the 60 knees, 32 were identified as lateral meniscus tears and 48 as medial meniscus tears. The tear configurations were identified arthroscopically as 27 complexes, 19 bucket handle, 18 longitudinal, 14 radial, 11 flap, and 2 horizontal. Based on MRI analysis, 32 lateral meniscus and 48 medial meniscus tears were identified. The tear configurations were evaluated as 33 complexes, 15 longitudinal, 13 radial, 11 bucket handle, 5 flaps, and 3 horizontal. MRI gave the same diagnosis as arthroscopy in 60 of the 80 meniscus tears (75%). For medial meniscus tears, MRI sensitivity was calculated as 91.5%, the specificity as 61.5%, the PPV as 89.6%, and the NPV as 66.7%. For lateral meniscus tears, the sensitivity was 84.4%, the specificity was 82.1%, the PPV was 84.4%, and the NPV was 82.1%. MRI was successful in the identifying the tear configuration in 81.8% of the complex tears, 81.8% of the bucket handle tears, 92.8% of the radial tears, and 83.3% of the longitudinal tears, but low accuracy was found in its identification of flap tears and horizontal tears, with values of 50% and 66.6%, respectively. When evaluating medial and lateral meniscus tears separately, MRI confirmed the true configuration of medial meniscus tears in 84.2% of the complex tears, 88.9% of the bucket handle tears, 33.3% of the flap tears, 100% of the radial tears, 85.7% of the longitudinal tears, and 50% of the horizontal tears. In the lateral meniscus tears, these rates were 78.6% for complex tears, 55.4% for bucket handle tears, 33.3% for flap tears, 88.9% for radial tears, 75% for longitudinal tears, and 100% for horizontal tears (Tables 1-3). With the widespread use of MRI, which began in the late 1980s, the musculoskeletal system and particularly the knee joint have been the second most commonly imaged area, after the central nervous system (5). MRI is preferred to other imaging tools because it is a noninvasive method and because it provides excellent information about osseous, chondral, and soft tissue due to its high resolution not just in the transverse plane, but in all three planes. MRI is also preferred because it does not require the use of ionizing radiation. Thus, MRI is one of the most frequently used imaging methods in the diagnosis of meniscus tears. The meniscus has many functions, including shock absorption during knee motions, protection of chondral sides, and increased congruence between the femur and tibia. Meniscus tears are one of the most frequently cited reasons for knee pain and disability. The use of MRI is still controversial for diagnosing meniscus tears. In various studies, the accuracy of MRI diagnostics ranges from 65 to 99. However, arthroscopic examination remains the gold standard in diagnosing meniscus tears. On an MR image, one criterion for a meniscus tear is either an internal high meniscus signal that exceeds the articular surfaces or abnormal meniscus morphology. There are a number of systems for the characterization of meniscus tears. Stoller et al. (6) graded the meniscus signal on MR images according to four levels: grade 0 has no internal high signal; grade 1 has circular foci of high signal; grade 2 has a linear high signal that does not extend to the articular surface; and grade 3 has a linear high signal that extends to the articular surface as a tear. Another frequently used grading system was described by Mesgarzadeh (7). In this grading system, Mesgarzadeh classified meniscus tears into eight types. However, the problem with this classification is that type I, type II, and type VII tears cannot be diagnosed by an arthroscopic examination because they are not open to the meniscal surface. In our study, we used the classification system developed by Jee et al. (4). In this classification, all tear types and tear morphologies can be described by either MRI or arthroscopic examinations. Definitions of tear types differ, and orthopedic surgeons may use different definitions. The optimal protocol for imaging meniscus tears likely includes a training session in which orthopedic surgeons and radiologists establish consensus on the relevant terminology, and greater observer experience can potentially improve the interpretation of different types of meniscus tears (8). Certain problems associated with MRI are likely to result in the misinterpretation of MR meniscus images. These potential pitfalls of meniscus MRIs include low-resolution MRIs, normal soft tissue between the capsule and the meniscus, previous meniscectomy, menisco-femoral ligament and popliteal hiatus, and tears that run parallel to the imaging plane (Figure 6) (7). Figure 6. MRI of a horizontal tear in medial meniscus. A, T1 sagittal image; B, T2 sagittal image; C and D, Continuous T2 coronal images (in this patient, a complex medial meniscus tear was seen in arthroscopic examination). In particular, considering protection against the risks of invasive procedures, MRI examination is preferred because it is a rapid, noninvasive method compared with diagnostic arthroscopy (9). Crawford et al. (9) reported that MRI had a sensitivity of %91, specificity of %81, and accuracy of %86 for medial meniscus tears and values of %76, %93, and %89, respectively, for lateral meniscus tears. Considering the costs and time consumption of MRI, they reported that specific MRI sequences would be extremely effective in the analysis of meniscus and other knee pathologies (9). In a series of 2,000 cases, Liodakis et al. (10) found that the rate of preoperative MRI did not reduce the possibility of purely diagnostic arthroscopy and reported that MRI examination was useful for examining suspicious injuries and planning complex knee trauma operations. In the literature, MRI has been determined to have a sensitivity range of %87 - 97 and a specificity range of %77 - 89 when evaluating medial meniscus lesions; for lateral meniscus lesions, its sensitivity range is %72 - 90 and its specificity range is %87 - 92.5 (11, 12). In the current study, MRI was determined to have a sensitivity of %91.5 and a specificity of %61.5 in medial meniscus lesions and values of %84.4 and %82.1, respectively, in lateral meniscus lesions. These results are consistent with those reported in literature. De Smet et al. (13) found a low MRI sensitivity rate for lateral meniscus tears. They reported a misdiagnosed rate of %20, and most of the tears were located in the posterior horn of the meniscus. This tear location was most likely due to the popliteal hiatus and complex anatomy of the lateral meniscus posterior horn. Herman et al. (14) suggested that the lateral inferior geniculate artery may also account for misdiagnoses of horizontal and bucket handle tears of the lateral meniscus. With respect to the medial meniscus, the MRI sensitivity rates reported in the literature for bucket handle tears are also low. Watt et al. (15) found a sensitivity rate of %44 for bucket handle tears in the medial meniscus, and they emphasized that the absence of a bow tie sign is valuable in diagnosing these tears. Although Van de Berg et al. (16) found a high sensitivity range (%62.7 - 65.77) in medial meniscus tears; their study included both bucket handle and flap tears and used 0.3-mm intervals to obtain the images. Slice thickness could be a reason for the low sensitivity rates observed in the current study. Another important factor in improving MRI sensitivity for medial meniscus tears may be having a musculoskeletal radiologist evaluate the images. In our study, the images were evaluated by a general radiologist, which could account for the low sensitivity rates observed. Some researchers have reported that the duration of time between MRI examination and arthroscopic testing could be a significant factor (11). It has been reported that the sensitivity rate (%85) of arthroscopy applied within six weeks of MRI examination was higher than in later applications (%72) (11). However, in a study by De Smet and Graf, no statistically significant difference was found between the sensitivity rates for patients who underwent arthroscopy within six weeks of MRI examination and the sensitivity rates for those who underwent arthroscopy later (17). In the current study, the time period between MRI and arthroscopy was kept within two months to reduce the possibility of additional injury and avoid deviations in the sensitivity rate. In the current study, MRI was determined to have a sensitivity of %100 in horizontal and bucket handle tears, %80 - 100 in complex and radial tears, and relatively lower rates in longitudinal and flap tears. In certain patients, ligament and muscle injuries that develop secondary to serious trauma and are accompanied by other pathologies such as bone contusions and an increase in intra-articular fluid require very careful examination with respect to meniscus tears, which are often affected following trauma. In addition, the finding that MRI had a lower rate of diagnosis for longitudinal and flap tears compared with the other types could be attributed to the tendency to misinterpret tears as concomitant ligament injuries, such as anterior cruciate ligament (ACL) rupture, which can develop secondarily to trauma. In patients with ACL tears, the sensitivity of MRI in identifying meniscus tears was reduced, and the meniscus must therefore be more carefully examined in trauma patients with ligament injury (18, 19). Identifying the configuration of meniscus tears is important for planing subsequent treatment (20). Although meniscus repair has become more frequent in recent years, partial meniscectomy is applied in patients in whom repair is not possible (21). Therefore, it is important to know the configuration of the meniscus tear when defining the treatment and explaining to the patient the process after arthroscopy. In oblique and longitudinal tears, meniscus repair is possible (20). Physicians must explain to patients with these types of tears that there can be no weight bearing on the injured leg for four to six weeks and that the rehabilitation period after arthroscopy will vary. In meniscus tears that are identified within the first eight weeks, the success rate of meniscus repair is better (22). Particularly for high-performance athletes, knowing the tear configuration and whether surgery on a repairable tear can wait until the end of the season are important for making the right decision at the time of arthroscopy (3). Of the repairable tears addressed by the current study, medial meniscus longitudinal tears were determined to have a sensitivity rate of %79 and a specificity rate of %97, and bucket handle tears had %100 and %98 sensitivity and specificity, respectively. However, in lateral meniscus longitudinal tears, the sensitivity fell dramatically to %50. Flap tears are considered unstable meniscus tears. These tears are partially separated from the intercondylar notch or the meniscal recesses, and proper identification is important because of the treatment needed. In the current study, low sensitivity but high specificity was found in flap-type tears in particular. This is in line with a study by Van de Berg et al. (16), in which sensitivity was determined at %69 and specificity at %94 (16). Osteophytes, torn ACL, and menisco-capsular ligaments or loose bodies in the knee joint could be misdiagnosed as flap tears, especially in tears that have moved to the peripheral recesses or central region of the knee. Our study has some limitations. First, arthroscopic examination was performed by only one surgeon, but other reports have suggested that the use of different surgeons and different techniques may impact accuracy percentiles. Our second limitation was that all the MRIs were examined by a general radiologist. A musculoskeletal radiologist may contribute to higher sensitivity and specificity rates, because as some studies have suggested, the examination of an MRI may vary based on the experience of the radiologist. Three Tesla MRI tools have recently come into use, and the high resolution capacity of these machines may increase the accuracy of identifying tear configurations. Imaging intervals are also important in evaluation of the tears. The study by Van de Berg et al. (16) used 0.3-mm imaging intervals, which may increase the sensitivity, even in 1.5 Tesla MRIs. Finally, we did not perform a retrospective analysis of the misdiagnosed tears, which may have given us more information regarding diagnostic mistakes. In conclusion, MRI is an important tool in the imaging of meniscus tears, but it has low sensitivity in identifying the configuration of longitudinal and flap tears, which could require arthroscopy. Nevertheless, when planning a surgical protocol for patients and determining the postoperative prognosis, MRI examination together with a good clinical evaluation can be considered useful. Authors’ Contribution: Study concept and design: Nilüfer Tekin and Gülseren Yirik; acquisition of data: Nilüfer Tekin and Çağrı Tekin; analysis and interpretation of data: Murat Çakar, Haluk Çabuk; drafting of the manuscript: Murat Çakar and Nilüfer Tekin; critical revision of the manuscript for important intellectual content: Kürşat Bayraktar and Gülseren Yirik; statistical analysis: Müjdat Adaş and Yusuf Özcan; administrative, technical, and material support: Murat Çakar, Çağrı Tekin and Yusuf Özcan; study supervision: Kürşat Bayraktar, Müjdat Adaş and Haluk Çabuk. 1. Carmichael IW, MacLeod AM, Travlos J. MRI can prevent unnecessary arthroscopy. J Bone Joint Surg Br. 1997;79(4):624-5. [PubMed: 9250751]. 2. Trieshmann HW, Mosure JC. The impact of magnetic resonance imaging of the knee on surgical decision making. Arthroscopy ( J Arthroscopic Related Surg). 1996;12(5):550-5. 3. Newman AP, Daniels AU, Burks RT. Principles and decision making in meniscal surgery. Arthroscopy ( J Arthroscopic Related Surg). 1993;9(1):33-51. 4. Jee WH, McCauley TR, Kim JM, Jun DJ, Lee YJ, Choi BG, et al. Meniscal tear configurations: categorization with MR imaging. AJR Am J Roentgenol. 2003;180(1):93-7. doi: 10.2214/ajr.180.1.1800093. [PubMed: 12490485]. 5. Sartoris DJ, Resnick D. MR imaging of the musculoskeletal system: current and future status. AJR Am J Roentgenol. 1987;149(3):457-67. doi: 10.2214/ajr.149.3.457. [PubMed: 3497529]. 6. Stoller DW, Martin C, Crues J3, Kaplan L, Mink JH. Meniscal tears: pathologic correlation with MR imaging. Radiology. 1987;163(3):731-5. doi: 10.1148/radiology.163.3.3575724. [PubMed: 3575724]. 7. Mesgarzadeh M, Moyer R, Leder DS, Revesz G, Russoniello A, Bonakdarpour A, et al. MR imaging of the knee: expanded classification and pitfalls to interpretation of meniscal tears. Radiographics. 1993;13(3):489-500. doi: 10.1148/radiographics.13.3.8316659. [PubMed: 8316659]. 8. Matava MJ, Eck K, Totty W, Wright RW, Shively RA. Magnetic resonance imaging as a tool to predict meniscal reparability. Am J Sports Med. 1999;27(4):436-43. [PubMed: 10424212]. 9. Crawford R, Walley G, Bridgman S, Maffulli N. Magnetic resonance imaging versus arthroscopy in the diagnosis of knee pathology, concentrating on meniscal lesions and ACL tears: a systematic review. Br Med Bull. 2007;84:5-23. doi: 10.1093/bmb/ldm022. [PubMed: 17785279]. 10. Liodakis E, Hankemeier S, Jagodzinski M, Meller R, Krettek C, Brand J. The role of preoperative MRI in knee arthroscopy: a retrospective analysis of 2,000 patients. Knee Surg Sports Traumatol Arthrosc. 2009;17(9):1102-6. doi: 10.1007/s00167-009-0835-8. [PubMed: 19554312]. 11. Cheung LP, Li KC, Hollett MD, Bergman AG, Herfkens RJ. Meniscal tears of the knee: accuracy of detection with fast spin-echo MR imaging and arthroscopic correlation in 293 patients. Radiology. 1997;203(2):508-12. doi: 10.1148/radiology.203.2.9114113. [PubMed: 9114113]. 12. Kelly MA, Flock TJ, Kimmel JA, Kiernan HA, Singson RS, Starron RB. MR imaging of the knee: clarification of its role. Arthroscopy ( J Arthroscopic Related Surg). 1991;7(1):78-85. 13. De Smet AA, Mukherjee R. Clinical, MRI, and arthroscopic findings associated with failure to diagnose a lateral meniscal tear on knee MRI. AJR Am J Roentgenol. 2008;190(1):22-6. doi: 10.2214/AJR.07.2611. [PubMed: 18094289]. 14. Herman LJ, Beltran J. Pitfalls in MR imaging of the knee. Radiology. 1988;167(3):775-81. doi: 10.1148/radiology.167.3.3363139. [PubMed: 3363139]. 15. Watt AJ, Halliday T, Raby N. The value of the absent bow tie sign in MRI of bucket-handle tears. Clin Radiol. 2000;55(8):622-6. doi: 10.1053/crad.2000.0500. [PubMed: 10964734]. 16. Vande Berg BC, Malghem J, Poilvache P, Maldague B, Lecouvet FE. Meniscal tears with fragments displaced in notch and recesses of knee: MR imaging with arthroscopic comparison. Radiology. 2005;234(3):842-50. doi: 10.1148/radiol.2343031601. [PubMed: 15734936]. 17. De Smet AA, Graf BK. Meniscal tears missed on MR imaging: relationship to meniscal tear patterns and anterior cruciate ligament tears. AJR Am J Roentgenol. 1994;162(4):905-11. doi: 10.2214/ajr.162.4.8141016. [PubMed: 8141016]. 18. De Smet AA, Tuite MJ, Norris MA, Swan JS. MR diagnosis of meniscal tears: analysis of causes of errors. AJR Am J Roentgenol. 1994;163(6):1419-23. doi: 10.2214/ajr.163.6.7992739. [PubMed: 7992739]. 19. Jee WH, McCauley TR, Kim JM. Magnetic resonance diagnosis of meniscal tears in patients with acute anterior cruciate ligament tears. J Comput Assist Tomogr. 2004;28(3):402-6. [PubMed: 15100548]. 20. DeHaven KE. Meniscus repair. Am J Sports Med. 1999;27(2):242-50. [PubMed: 10102109]. 21. Hede A, Larsen E, Sandberg H. The long term outcome of open total and partial meniscectomy related to the quantity and site of the meniscus removed. Int Orthop. 1992;16(2):122-5. [PubMed: 1428307]. 22. Eggli S, Wegmuller H, Kosina J, Huckell C, Jakob RP. Long-term results of arthroscopic meniscal repair. An analysis of isolated tears. Am J Sports Med. 1995;23(6):715-20. [PubMed: 8600740].